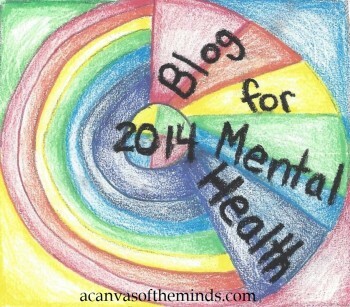 “I pledge my commitment to the Blog for Mental Health 2014 Project. I will blog about mental health topics not only for myself, but for others. By displaying this badge, I show my pride, dedication, and acceptance for mental health. I use this to promote mental health education in the struggle to erase stigma.” To learn more or to participate, please refer to A Canvas of the Minds: Blog for Mental Health 2014 Project . Wow, I can’t believe it’s been nearly a year since my last post. I began this blog last September during some rare down time as I was starting to reevaluate the priorities in my life. I got off to what I thought was a good start but saw very quickly the posts began to devolve into what I felt was a whiny soapbox for a life which, considering my circumstances, was not all that bad. That nagging sensation caused me to back away from posting. I have been here all along, reading what others have written, empathizing with their stories, and commenting on occasion. I think the new year is a perfect time to start things back up and I am proud to participate in this year’s Blog for Mental Health effort. For those of you who are new to my blog, I am type 1 bipolar with rapid cycling and mixed states. That being said, I am lucky to have been able to parlay this challenge in recent years into an uncharacteristically high-functioning existence, I don’t know whether it is pure stubbornness or ego, or residual manic delusion, but i know I am one of the lucky ones (as much as I may tend to forget at times). There were some years prior where I wasn’t so lucky, or responsible, or aware of the consequences of my actions and I continue to feel those effects, but I can only now look forward, change what I can, hope for the best, and help others when I am able. It is my hope that the more of us who gather together to support one another and educate those around us, the faster we can begin to eliminate the stigma that still surrounds us. We are taught to hide in shame from our illnesses in fear of loss in relationships, friendships, and professional credibility. People fear what they do not know, so let’s educate the fear away, raise our voices, and support each other in the cause. I pledge to become a more active participant in my own transformation as well as the transformation of public perception. I am not quite yet ready to “go public” with my real identity (as I see some of you…much braver than i…have started to do) but from this small, anonymous platform, I will toss my tiny pebble into the lake and see if I can make a ripple or two along the way.